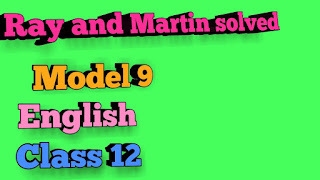 Hi students today we will discuss about some important Answers to the English question bank Ray and Martin solved Model 9. The Hermit was a thin and weak man. Whenever he struck the ground with the spade and turned a little earth , he Breathed heavily out of exhaustion. The Tsar saw that the hermit was feeling out of breath at every stroke he made. The Tsar felt pity for this weak person and offered to dig for him. The hermit accepted the offer and sat down, giving the spade to the Tsar. He dug two beds and continuously worked for two hours till the sun went behind the trees in the wood. Ans : see the answer of model 8. Question no 3. Prose section. Ans : As Kalam's father was a spiritual man he got up at 4 a.m. by reading the Namaz after the dawn. Even in his let sixties his father was physically active and quite hard working. After reading the Namaz he used to start on foot to reach a coconut grove, owned by the family and located four miles away from his home. He returned home by carrying the heavy load of a dozen of coconuts, slung on his shoulder for the consumption of the family. After accomplishing his duty for his family he used to take his breakfast. Ans : in Ruskin Bond's short story' the eyes have it' the narrator had been travelling in a vacant train compartment. At Rohana a girl got in. When the girl entered into the compartment the slapping of her slippers against her heels and her voice attracted the narrator. The narrator was also bored by solitude till Rohan Station. So he was thrilled at the prospect of a conversation with a girl and asked her if she was going all the way to Dehra. He also thought that if he conversed with the girl in a simple manner his blindness might be prevent from her. so the narrator tried to be familiar with a girl. Ans :see the answer of poetry section model 7. Questions no 1. Ans : here the hollow is referred to the small green valley in the poem' asleep in the valley 'written by Arthur rimbaud. The sun's rays fills the hollow full of light. The poet gives a beautiful picture of a valley in his poem. The vegetation of the valley is nourished by the sunlight and the sparkling waters of the silvery rivulet that flows softly at its will beautifying the valley. The entire Valley looks bright and charming as the sunlight fills up the place. Ferns grow in plenty and the soldier lying asleep in the valley has a pillow of fern under his head. There is also a wide variety of flowers of various colours. Moreover, there are also various species of insects. They sweetly Hum near the soldier. The landscape is so charming that the readers receive a rude shock when he comes to know that the soldier is actually dead. Ans : here the eternal lines refer to Shakespeare's poetry Sonnet 18. 'thou' here refers to the poets friend Mr W. H.
Death shall not be able to brag about its power over every Mortal as the poet's friend despite being Immortal will achieve immortality through the poet's verse. Death will never be able to make the poet's friend surrender to it. Although death comes down in every creature's life yet it cannot touch the poet's friend as he will be immortalized in words. Ans : The lines are taken from Keats poetry 'the poetry of Earth'. Here 'he' refers to the grasshopper. He takes the lead in summer. In the Octave of keats Sonnet summer is characterized by the hot sun. The merciless sun rays force all the song Birds to stop singing and take refuge in the refreshing coolness of the trees. Just then a tiny grasshopper takes up the natural Symphony with its chirping. He seems to enjoy to his heart's content the luxurious abundance of the season. This is in poet's terms is called summer luxury. Ans : see the answer of model number 3. Proposal 1. Ans : see the answer of model number 1. Proposal 3. Ans : in Anton Chekhov's one act play' the proposal', all the characters are some way or the other influenced by the marriage proposal. Lomov is desirous of having a wife. Natalya has not found her man to marry. Chubukov is worried about his daughter. He wanted to get relief by getting his daughter's married. Lomov's intention makes chubukov Jubilant. However before expressing his proposal to Natalya Lomov becomes entangled in two long arguments with her. So Natalya does not get any proposal from Lomov. However, the proposal is successfully complimented by the marriage at the end because of chubukov's Presence of Mind. For this the title the proposal is quite apt and justified. Our school conducted an educational tour for the students of class 12. It was a one day tour. We were taken to Kolkata Science City for our trip. 45 students were accompanied by a team of 5 teachers and 5 security guards. We boarded the bus on 6th January morning and reached Kolkata at 10 a.m.. the bus journey was enjoyable. Throughout the journey we chatted, played Antakshari and sometimes gathered about the windows to witness the beauty of nature. We visited the Science City and were awestruck by the majestic structures. We learnt about many things from this tour. we also went shopping in a mall near Howrah Maidan. We returned home at 10:00 p.m. the trip was both educative and fun. Ans : see the answer of model 5. Writing section. 2.